Has this wallet-friendly NAS made too many compromises? Quick enough to cope with file sharing as well as hosting email and other applications normally run on a Windows or Linux server, the DS414j ticks most of the boxes for a small business NAS appliance. 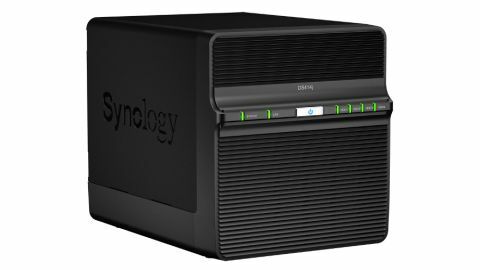 The newest member of Synology's popular family of Network Attached Storage (NAS) appliances, the DS414j, is the first of its budget-friendly "j" series to feature a dual-core processor which, according to Synology, gives it a throughput ceiling of 112 MB/sec when reading data and 80 MB/sec when writing. Add in a maximum capacity of 20TB spread across four disks plus a fast USB 3.0 port for backups and you have a product suitable for small business as well as demanding home use. However, with a recommended price of just £258 (ex VAT, around US$440, AUD$465), you can't expect too many bells and whistles, and indeed compromises have been made to achieve this price point. In design terms Synology has gone back to its roots with the DS414j, housing the new appliance in a utilitarian black cube powered by a chunky external AC adapter. Build quality is reasonable, although nowhere near as good as on more expensive Synology products. The front-mounted USB port found on other models is missing too, plus there's a surprise waiting for anyone expecting to load disks from the front as the DS414j fascia is fixed, containing little more than a central power button flanked by status LEDs. To gain access to the innards you have to go round the back, unscrew the four thumbscrews and lower the hinged rear panel holding the two cooling fans. The top cover can also be removed, and inside there's a metal chassis containing four plastic carriers to take either 3.5in or smaller 2.5in SATA disks – or SSDs if you can afford them. The disks have to be screwed in place (screws are provided), slid back inside and the case re-assembled, so it's all very basic and not exactly hot-swap. On the plus side, however, it's not something buyers will have to do that often and it also stops anyone popping out a disk by "accident". The interfaces are all at the back, too, with a connector for the external AC brick, a single Gigabit Ethernet port for network attachment and two USB connectors, only one of which is USB 3.0. The motherboard, meanwhile, is tucked away in the base of the unit accommodating a Mindspeed Comcerto C2200 processor with dual 1.2GHz ARM cores supported by a fixed 512MB of DDR3 memory. Again, not the most comprehensive of specifications, but adequate on an appliance designed to handle little more than basic file sharing on a small business or home network. Supplied diskless, most SATA disks up to 5TB will work inside the DS414j and you can even mix sizes, although you will lose capacity if you combine different sizes to create a redundant array. For optimum capacity and performance, matching drives are recommended and for our tests we fitted a pair of NAS-optimised 1TB WD Red drives, retailing at just under £50 each inc VAT (around US$85, AUD$90). Other capacities are available in this series, topped out by 4TB versions at around £132 inc VAT (around US$225, AUD$240), which would mean spending £528 (around US$905, AUD$955) to equip the DS414j with 16TB of storage using the WD drives. The default technology employed here is Synology Hybrid RAID (SHR) which takes care of all the hard work involved in configuring an array automatically, even dynamic expansion of volumes when a new disk is added and rebuilding the array following a disk failure. That said, standard RAID technology up to and including RAID 6 is an option. Hot sparing is also supported and migration from one RAID level to another without loss of data, although this can take an appreciable amount of time. The latest version of Synology's DiskStation Manager software – DSM 5.0 – provides all this and other functionality with a now very slick procedure whereby you download the OS from the web and install it onto the appliance. That done, management is handled remotely via a remarkably easy to follow desktop GUI that runs in a browser. It's worth noting that the DSM 5.0 software does a lot more than just handle NAS file sharing with, for example, iSCSI support also available for block-level sharing on a storage area network (SAN). In addition there are tools to create and manage user accounts and privileges, set quotas and so on, just like on a "real" file server (but a lot simpler). Simple remote access via the cloud is another standard option plus there are lots of apps that can be downloaded and run on the appliance (Synology calls them packages), including an antivirus scanner, email, web and other servers. Some care is needed, however, not to compromise file sharing by installing too many add-on packages. To test the DS414j we configured our disks as a single volume, and made it available on the LAN as a Windows SMB share, although the appliance also supports Apple Mac and NFS protocols and, underneath, relies on a native EXT4 file system. We then ran file copy tests from a Windows PC fitted with an SSD using a Gigabit switch linking the two together. Employing a mix of files including both small Word and Excel documents and much larger PowerPoint and video files, we saw throughput rates of up to 72MB/sec when writing to the Synology NAS and 82MB/sec when reading. This is well below what Synology claims but that's to be expected and, in fairness, pretty good for this kind of budget NAS.